Posted by cafuego on Saturday 20 February 2016. 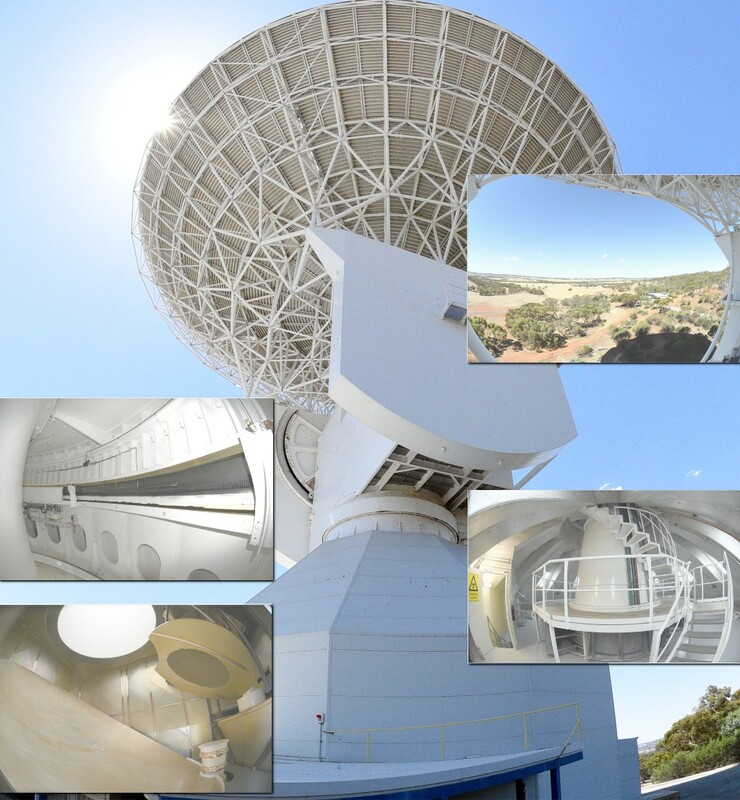 Whilst not working, I stumbled across a retweet by the European Space Agency, asking for people to apply to visit their deep space tracking station in New Norcia, Western Australia (NNO) as part of their SocialSpace programme. I didn't really have anything on, qualified to apply by way of having an ESA member nation passport, don't live more than 16 hours flying away, so I thought "why not?". Why not indeed. I applied a few days before the closing date and only a week later I got the happy news I'd been selected to attend. I immediately grabbed some return tickets to Perth and then started fretting about doing this thing with 15 total strangers. Eep! Time-lapse of land-fall over southern WA, after crossing the Great Australian Bight. The trip to New Norcia was in a lovely airconditioned bus, which made coping with the heat wave rather easy. As an ice-breaker, we all shared a group dinner that evening at the New Norcia hotel. After a round of 140 character introductions, we split into groups and each group was joined by an ESA engineer, who talked a little about who they were and the work they did on the site. 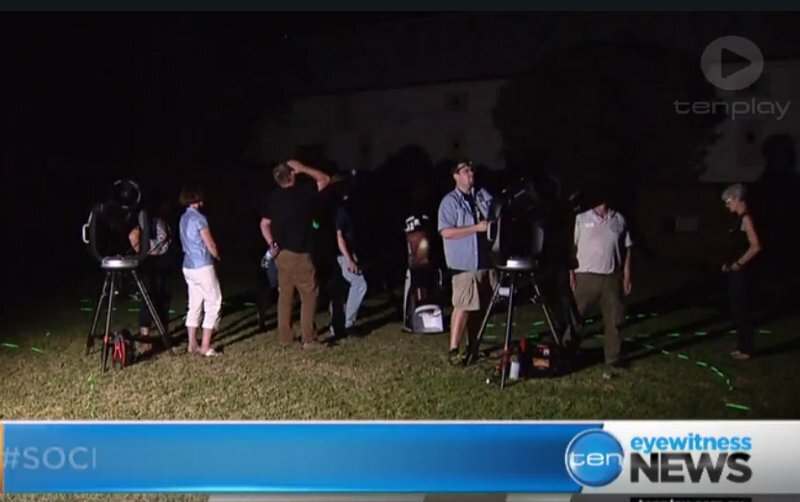 After dinner, John Goldsmith gave a talk about astrophotography and the sights of the night sky in preparation for an observing session with some people from the Perth Observatory, who'd driven up with cars full of (rather lovely) telescopes. Sadly I missed the talk because I was volunteered to help out with the telescopes. On the up-side, that resulted in my first TV appearance ever on Channel 10 in Perth. The seeing was excellent (New Norcia has proper dark skies) so it ended up being a fairly late night. Unfortunately, that meant the morning wasn't quite as early as I'd hoped it would be. Because of the dark skies, and three hour time difference with home, I had planned to not go back to Perth for the night. Instead, I wanted to stay in New Norcia and then get up early to catch the planetary alignment in action. I ended up seeing it just fine, but it was getting a little bit too light at that stage to easily cature all planets on camera. Because most delegates elected to stay back in Perth overnight (where the hotels have airco) they wouldn't be back before 10am, which gave me time to have a nice and relaxing early morning at the hotel, with fresh coffee. Once my partners in crime had arrived, we all moved to the ESA education room at the New Norcia monastery for some enlightening sessions about the ESA Tracking Network (ESTRACK) and NNO by ESA engineers. Yves Doat spoke about why the ESTRACK network is needed and what it currently consists of. He showed us highlights of some of the missions they've supported over the past decades, from the Giotto mission past Halley's Comet in 1986 through to the current Rosetta/Philae mission to comet 67P Churyumov-Gerasimenko. Klaus-Jürgen Schulz dove into the details of deep space communications and paid particular attention to the difficulties of communicating with spacecraft that are close to the sun (which is an issue for the BepiColombo mission to Mercury, of course!) he finished his presentation by telling us about the future of deep space communications, using light rather than radio, to obtain much higher rates of data transmission. Next, Marc Roubert explained the operational intricacies of running ground stations. Since they are generally located in relatively remote radio-silent areas, getting construction materials and equipment to the site can pose a real problem. Bush fires, sand storms, snow and the occasional leopard (for the Argentinian site) can interfere with operations as well. Their location can also pose problems for the power supply. The sites use a lot of power to cryo-cool the amplifiers. Fire can cut power lines, so generators are needed. All delegates became very excited when he said that due to the cost of power in Australia, NNO was actually going solar. ESA have built a 250kW solar plant on the New Norcia site, which will pay for istelf in only 7 years and save about 400 tons of CO2 per year. They're not yet allowed to feed power back into the grid, because the infrastructure wouldn't be able to cope. But they built the plant to produce only as much power as they need, so there isn't that much to feed back currently anyway. Gunther Sessler then gave us the low-down on the new NNO-2 antenna. How it was constructed and what it can do that the 35m NNO-1 antenna can't, which is mainly obtain signal from spacecraft even if they're slightly off-course (which can happen easily if a rocket slightly over- or underperforms at launch). As it turns out, the 35m NNO-1 antenna has a beam with of 60 millidegrees and to acquire a signal from a spacecraft, it has to be somewhere within that beam. I did the maths on that, and 60 millidegrees equates to a circle with a diameter of only 200m at a distance of 1000km (eg: a spacecraft on its way to orbit just clearing the horizon) Now 200m sounds like a lot, but when you realise a spacecraft is doing upwards of 5km/sec at that point, locking on to it becomes a much harder problem! That's where the wider beam width of the 4.5m NNO-2 antenna comes in. It can see a larger part of the sky, so can pick up spacecraft that are slightly off-course a lot easier. And if the space craft is even more off-course, the 0.75m antenna has a wider beam width still. With some smarts, once the 0.75m antenna locks on to a spacecraft, it can be used to center the 4.5m dish on it in turn. And once the 4.5m antenna is locked, its data can be used to in turn lock the 35m NNO-1 on the craft. The final presentation was by Peter Droll, who put it all together and gave us an overview of how ESTRACK was used to send the Lisa Pathfinder mission on its way to the L1 langrange point. That was done by boosting its orbit with several engine burns, after ach of which the crafts position needed to be known exactly in order to caculate the next burn. We had a quick lunch after the presentations and then hopped back on the bus to go see the NNO dishes. The Inmarsat Cricket Team had prepared well and gave us a tour of NNO-1, allowing us to stick our heads absolutely eveywhere. The only spanner in the works in terms of social media was that the inside of the dish is really well shielded against radio interference, so all our phones stopped working! Luckily, the Nikon with borrowed fish-eye lens worked fine. You can see all of my SocialSpaceWA photos on Flickr. Taking NNO-1 for a joyride. Speeches over, we all hopped back on the bus to finally go and see the new NNO-2 antenna. It's located a few hundred meters away from the main complex and since we were still enjoying the heat wave, the transport was most welcome. That is, until the smaller of the buses couldn't cope with the rather steep hill and we all had to do the last hundred meters or so on foot. The sun was setting as we arrived at the NNO-2 site and with the thin crescent moon it made a rather lovely backdrop for the blessing of the new facility by three monks from the New Norcia Monastery, followed by the antenna doing a little dance. Good luck on you mission, NNO-2! Finally it was time to hop on the bus and head back to Perth and after a final farewell drink, all delegates went their separate ways again. But one thing we did all agree on: if you ever get the chance to do some accidental space tourism, take that chance with both hands and don't let go! 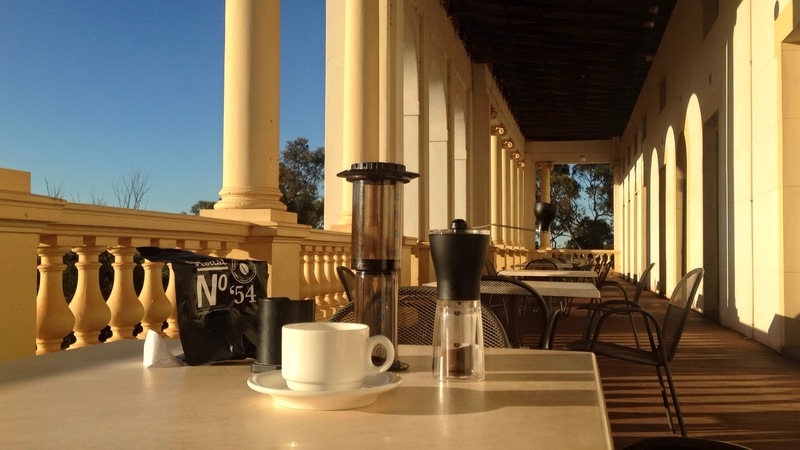 Thumbs up for New Norcia! 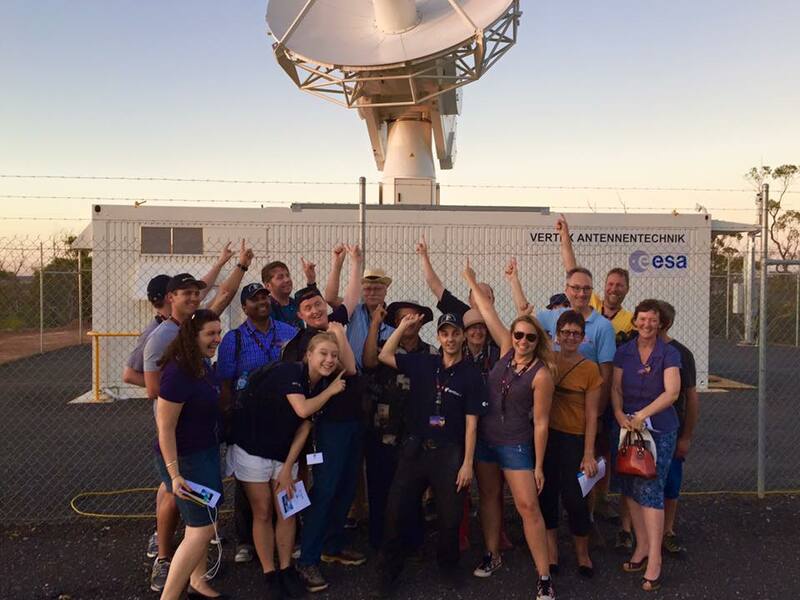 Thank you, ESA, Inmarsat and New Norcia! Aeropress and Mini Mill Slim. Someone knows how to travel the badass way.